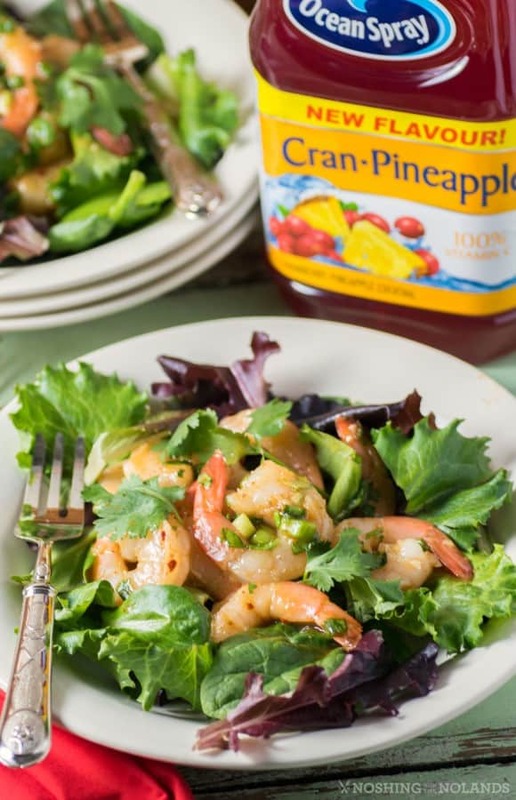 Spring has sprung and with that comes light and refreshing recipes like this Shrimp Salad with Cranberry Pineapple Marinade using Ocean Spray® Cran·Pineapple™ Cocktail. We are huge lovers of Ocean Spray® Cranberry™ Cocktail at our house so I am really excited to add this new fruit juice cocktail to our weekly shopping list. On the first sip you still get the wonderful tart cranberries shining through but then the pineapple juice pops in and finishes the beverage with a lovely tropical sweet finish. A great thirst quenching beverage that you will love including in your recipes and beverages! Dreaming of your next tropical vacation? Jump on over to Ocean Spray® Facebook page to enter to win a weekend getaway to the tropics! Tell them where you would like to sip on Cran-Pineapple™ Cocktails in the top pinned post by entering a comment and that dream could become reality. Enter for a chance to win one of three runner-up tropical-themed party packs (estimated value $300.00) or the ultimate grand-prize tropical getaway (estimated value $4,500)! I found this recipe exciting with its Indian flavors. For me I love a salad or appetizer with a big punch of flavors. That doesn’t mean it needs to be spicy hot but just the right spice balanced with the lovely sweetness of the Ocean Spray® Cran·Pineapple™ Cocktail. Ocean Spray’s® Cran·Pineapple™ Cocktail gives you 100% of your needed daily vitamin C per serving. It is a fun drink that young and old will enjoy from morning to night! I was excited to get cooking with this delightful beverage. You can practically taste the flavor of this delicious recipe right here in this picture. This dish would work well for a side salad, a main or an appetizer. The salad is very simple to make, purchasing already cooked shrimp saves loads of time. The marinade then whips up quickly and the shrimp are slid in and can be refrigerated for 3 hours to overnight. 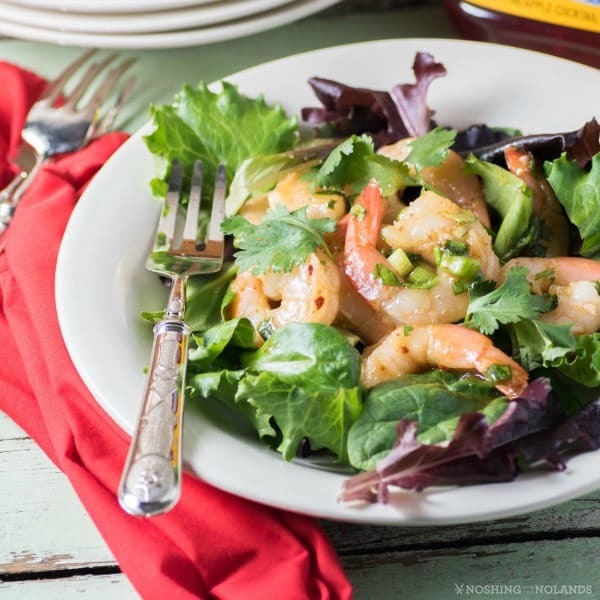 The shrimp are then served over baby greens with additional marinade as the dressing. Scrumptious!! For more tropical inspired recipe using Ocean Spray® Cran Pineapple™ Cocktail visit oceanspray.ca today! A gorgeous shrimp salad that is bursting with Indian flavors and the tropical sweetness of Ocean Spray® Cran·Pineapple™ Cocktail . In a large bowl, stir together all ingredients except shrimp and baby greens. Add shrimp; mix well. Refrigerate at least 3 hours or overnight. 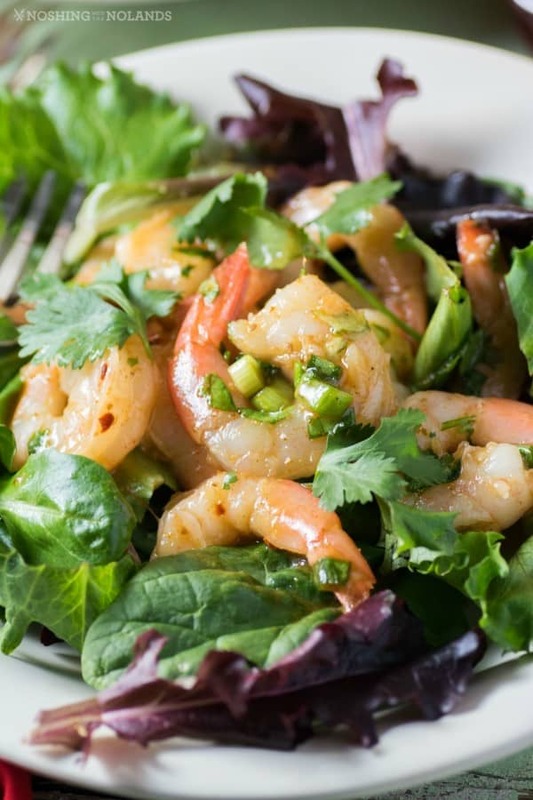 Serve shrimp over baby greens. The picture looks so good. 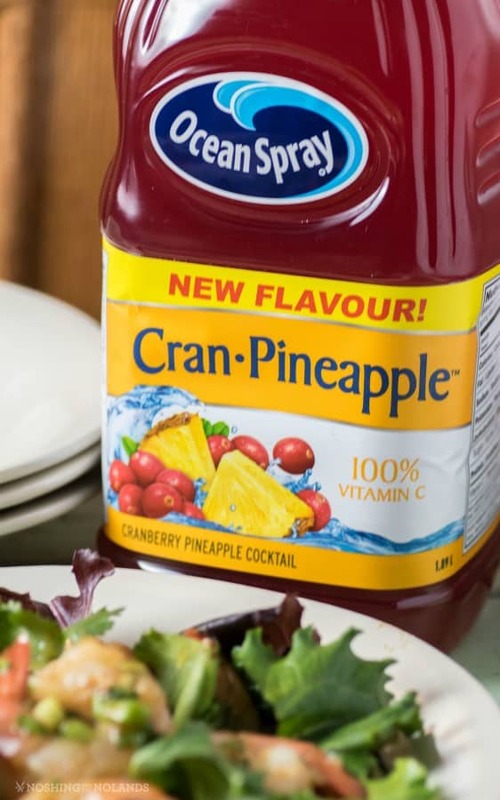 Great use of the cran-pineaple juice to give it a unique taste and everyone loves shrimp. Love the greens added to it. Oh my goodness I am going on a beach vacation really soon and there’s going to be a lot of seafood and a lot of pineapple and I cannot wait to put it all together in this recipe. Cran Pineapple? I must look for this. I’m a huge fan of Ocean Spray Cranberry juices, and this sounds delicious. Your Shrimp salad looks yummy too. 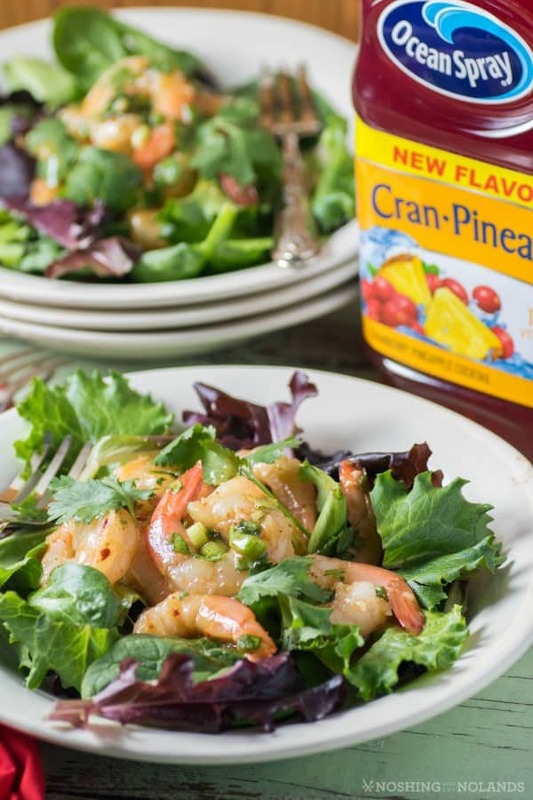 Shrimp Salad with Cranberry Pineapple Marinade sounds delicious! My wife, daughter and I love the Cranberry/pineapple juice as well! That sounds amazing! I love shrimp with a fruity touch like this. Thanks! 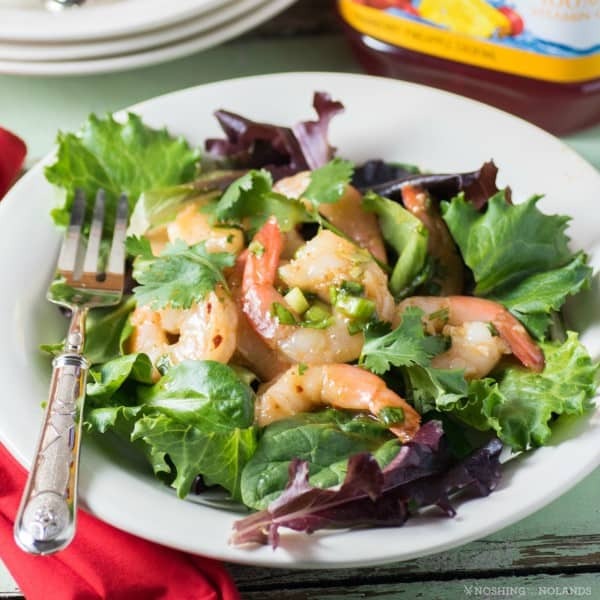 This Shrimp Salad with Cranberry Pineapple Marinade looks amazing. I will have to get the ingredients I need to make some this weekend. I am sure it will be a hit. We live right near Ocean Spray and love their products. I bet this recipe is mega delicious! This salad looks really good. I think I will make it for my next church brunch because it’s so easy, too. Oh my goodness! This salad recipe looks so delicious! I’m always looking for healthy salads that my family will enjoy. What an interesting combination of colors and flavors. By incorporating cranberryberry juice and pineapple, I bet this was delicious.